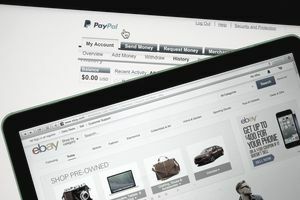 Potential eBay users wonder if they can use the website if they can't (or won't) use PayPal and what alternatives to PayPal exist to make financial transactions. Frankly, eBay and PayPal are joined at the hip, with PayPal being more important for profitability and growth than the eBay marketplace in the eyes of eBay corporation. No wonder, then, that eBay so heavily emphasizes PayPal, making it seem almost as though there are no alternatives to the service. Check to see if ProPay supports your country's currency. If they do, use eBay's advanced search tool, adding the keyword "ProPay" to your other keywords and checking the "Title and description" box, to find items whose descriptions list ProPay as a payment option. If you're really interested in an item whose seller doesn't yet accept ProPay, contact them to ask whether they might be interested in starting so that you can buy from them. If you're just interested in one or two purchases, consider having friends or family make the purchases on your behalf, receive the goods, then forward them on to you. This allows sellers most familiar with PayPal to continue to rely on PayPal even as you are able to buy the items you want. Just be sure to talk to the seller about what you're doing beforehand to make sure they're comfortable with it and to understand the implications for returns and exchanges clearly. If your distaste for PayPal leads you to want alternatives, consider ProPay (see the first answer above) or a merchant account with your local bank or credit union that will allow you to process credit card or e-check payments directly. This will create more work for you, but it gets you away from dependence on PayPal. If you're interested in shopping eBay but simply don't want to create yet another online payment account, don't worry—these days, you don't have to create a PayPal account to pay with a credit card through PayPal. You can simply plug in your payment information at checkout time, without creating an account, to pay for your purchase. Unfortunately, it's now against eBay rules to process most payments made by check or cash. The exception is for local pickup auctions—PayPal allows non-electronic payments if the parties will be meeting face-to-face. If you're a shopper, find these auctions using the advanced search tool. If you're a seller, be sure to create listings that allow for local pickup only and then specify that you require cash or check payment in person. Whether you're a buyer or a seller, if you're wary of electronic payments you should probably consider using an alternative that specializes in local deals, like Craigslist or eBay Classifieds. There are one or two other wrinkles that may be useful to you in eBay's present payments policy, so if your need wasn't addressed by one of the items above, read the policy carefully to see if you can find another option—keeping in mind that the choices aren't infinite and that most eBayers are PayPal or (in a distinct minority) ProPay users.